A CENTURY AND A HALF AGO, Patrick Miller, an Edinburgh banker, experimented with this pleasure steamer. A trial in 1788 was completely successful, and William Symington’s original engine was used as the motive power. The paddle-wheels were enclosed by semicircular boxes and placed between the two hulls of the vessel. The engine stood on one side of the twin deck and the boiler beneath the other deck. In addition to the steam engine, Miller’s ship had two masts equipped with sails. FOR centuries the world’s shipping was dependent for its movement on natural forces. The winds drove vessels from ocean to ocean, and in the narrow seas many-oared galleys, as well as lesser craft, were rowed by man-power. About three hundred years ago, however, man began to think of harnessing nature in another form. Some time later the power of steam was taken seriously into account, first on land for stationary work and later for the propulsion of ships. As early as 1630 David Ramseye was granted a patent for a steam engine that was intended to propel a barge or boat. In 1702 Thomas Savery suggested that his steam pumping-engine might prove of service for marine purposes. In neither instance, however, was any practical use made of these inventions for driving ships. The first real step in the application of steam to marine engineering was the patent taken out by Jonathan Hulls in 1736. 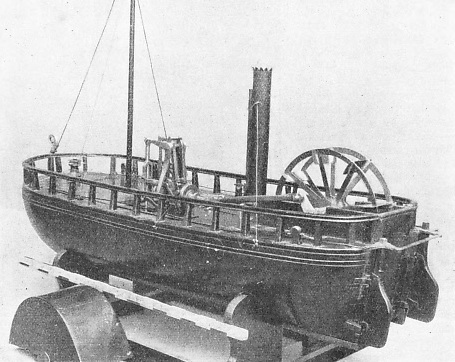 Hulls, who lived at Campden, in Gloucestershire, patented a form of steam tug-boat for towing larger vessels. It said that this early steamer was tried by Hulls on the River Avon at Evesham (Worcestershire) in 1737. The boat was provided with a paddle-wheel at the stern. The engine was of the atmospheric type invented by Newcomen in 1710, in which a weight pulled up a piston in an iron cylinder. Steam was admitted to the under side of the piston. Then, on the steam being condensed by a jet of water, the piston was forced down by atmospheric pressure and made to do useful work through suitable rods and levers. In Hulls’s experimental boat the sternpaddle-wheel was driven by the piston rod through the agency of a frictional ratchet gear. An interesting proposal by Hulls comprised the fitting to the paddle-wheel of cranks and a pair of connecting rods. These rods were to be allowed to rest on the river bottom, in shallow water, and so act as punting poles to assist the action of the paddle-wheel. A TUG-BOAT DESIGN OF 1736, proposed by Jonathan Hulls, provided for the use of a Newcomen atmospheric engine. It has been stated that Hulls experimented with a vessel of this type on the River Avon at Evesham (Worcestershire) in 1737. This interesting print represents Hull’s tug-boat towing a British warship of two centuries ago. The steam vessel is shown very high in the water to indicate the construction and to display the whole of the paddles, which in practice would have been partly submerged in use. The method of passing steam under pressure into a cylinder and then cooling it by means of a jet of water was wasteful and inefficient. In 1765 the famous James Watt invented a separate condenser, and this, with his other improvements to the stationary steam engine, brought nearer its application to the propulsion of ships. A Watt steam engine was used by a distinguished Frenchman, the Marquis de Jouffroy, in a remarkable boat built in 1776. This vessel was fitted with paddles, driven by a steam engine; the paddles worked in the same way as the webbed feet of a duck. In 1783 the Marquis de Jouffroy launched a steamer with paddle-wheels and an improved engine that plied on the river Saone-at Lyons for over a year. Jouffroy’s duck paddles and Hulls’s mechanical punting poles were not the only experiments in ship propulsion, for in December, 1787, James Rumsey, of Virginia, built a jet-propulsion steamer. This vessel was provided with a steam-driven pump that forced a stream of water from the stern and so propelled the ship forward. 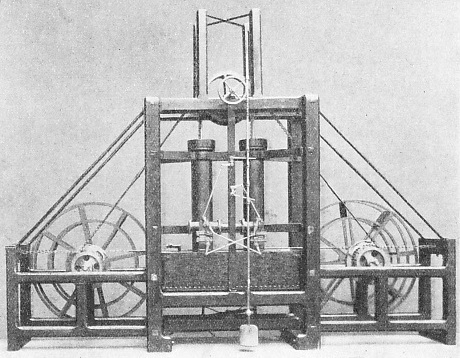 Yet another form of mechanical propulsion was achieved by John Fitch, of Pennsylvania, in 1787. Fitch fitted a boat with paddles, six on either side, driven by a 12-in steam cylinder. The paddles were worked in a manner similar to that of propelling a canoe by hand. 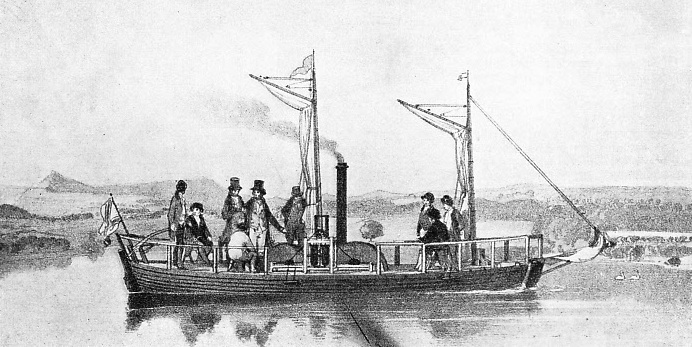 In 1788-89 John Fitch built two other steam paddle boats, the second of which attained a speed of eight miles an hour. In 1796 Fitch turned his attention to experiments with the screw propeller, which he fitted to an 18-ft boat on Collect Pond - long since drained and now forming part of New York City. 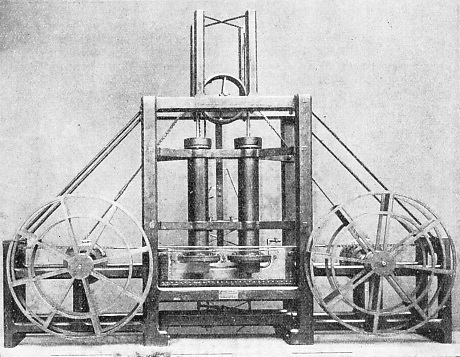 WILLIAM SYMINGTON’S FIRST MARINE ENGINE, patented in June, 1787, was built in 1788 and drove a double-hulled boat, 25 feet long, at a speed of five miles an hour. This engine is preserved in the Science Museum at South Kensington. The photograph shows the two paddle-wheels that revolved in the space between the two hulls. The open-topped cylinders drove the hollow drum above them by chains; this drum, by other chains, worked the paddle-wheels through ratchet gearing. The condenser tank, surrounding the lower ends of the cylinders containing air pumps, is shown with one side cut away. Another inventor who played an important part in the development of the steamboat at this period was Patrick Miller, an Edinburgh banker. His first ship comprised three separate hulls, the central one having a pair of paddle-wheels worked by manual power. In 1788 Miller built a double-hulled pleasure boat 25 feet long with a beam of 7 feet, and installed an engine patented by William Symington in 1787. The engine was placed in one of the hulls, and the boiler, a large “pot” - externally fired - was carried in the other hull. The two paddle-wheels, arranged fore and aft, revolved between the two hulls. The original engine, which may be seen at the Science Museum at South Kensington, London, was built up on a framework shaped in the form of an inverted T. Placed vertically in the frame are two open-topped cylinders, 4-in diameter and 18-in stroke. In either cylinder is a piston to which chains are attached, passing over a drum. Bach piston is also provided with a rod and overhead guides. As the pistons move up and down, the overhead drum is rotated in alternate directions, and this motion is imparted to the paddle-wheels by chains and ratchet gear. THE VALVE GEAR of Symington’s engine was operated by the long weighted rod seen in this picture. The ratchet wheels on the paddle-shafts will also be noted. Below the condenser tank is the rocking lever connecting the two air pumps. The four-posted structure above the cylinders constitutes the guides for the piston-rods. The cylinders are 4-in diameter, with a stroke of 18-in. Each ratchet consists of two loose pulleys, on the paddle-shaft, and provided with teeth on their inner flanges. Between the pulleys is a disk keyed to the paddle-shaft and carrying two pawls. As the chains from the overhead drum turn the loose pulleys in alternate directions, the pawls engage with the ratchet teeth and so drive the paddle-wheels continuously forward. The cylinders rest on a tank, forming the condenser, and in the lower end of each is a piston that serves as an air pump. The air pump pistons are connected at their lower ends by a small pivoted beam below the condenser tank. Either cylinder is provided with a valve-box containing a steam inlet and an exhaust valve, underneath which is a passage to the condenser controlled by a non-return valve. The valve gear comprises a system of tappets worked by a rod provided with four pins that lift the steam and exhaust valves of the cylinders. This rod is operated by a chain passing over a pulley on the end of the overhead drum-shaft. Symington’s engine is an atmospheric engine, similar to that described earlier in this chapter but fitted with a separate condenser. The action is as follows: when one of the working pistons reaches the bottom of its stroke, the cylinder steam valve is opened and a valve in the air pump piston is closed. The piston is forced down by the steam until the pressure in the condenser rises to that of the atmosphere. The valves of the condenser then lift, and the air, steam and water are discharged into the tank. While one piston is ascending, the other is being forced down by atmospheric pressure, this being the working stroke of the engine. After the success of his engines in Miller’s boats, Symington obtained financial assistance from Lord Dundas, and in 1801 was launched the famous steamship Charlotte Dundas. This vessel was built by A. Hart of Grangemouth (Stirlingshire), and was 56 feet long with a beam of 18 feet and a depth of 8 feet. The engine was by Symington. Although it was similar in working principles to his earlier engines, many important improvements were introduced in the power plant of the Charlotte Dundas. A single direct-acting cylinder was employed, 22-in diameter and 4 feet stroke, developing a nominal 10 horse-power. The engine was placed on the deck, and the piston rod was provided with crosshead and guides to take the thrust of the connecting rod. This rod drove direct on to an overhanging crank on the paddle-shaft, an arrangement patented by Symington. Below the deck were accommodated the engine’s condenser and air pump, worked by a bell-crank from the crosshead. THE CHARLOTTE DUNDAS was successfully tried on the Forth and Clyde Canal in 1802. Built by A. Hart at Grangemouth, this ship was engined by William Symington. The engine was placed on deck and drove the paddle-shaft by a long connecting rod. In this model the paddle casing, in the foreground, has been removed to show the wheel and floats. The Charlotte Dundas was 56 feet long, and had a beam of 18 feet and a depth of 8 feet. Steam was supplied by an internally fired boiler, and the engine drove a paddle-wheel working in a recess 4 feet wide and 12 feet long at the stern. The stern, which was double to accommodate the paddle-wheel recess, was provided with two rudders controlled by a steering wheel forward. This remarkable stern-wheeler of 1801 was not only among the first steamers launched, but was also the forerunner of a distinct type of vessel, now improved in detail, of course, but still in existence, particularly on the rivers of Africa, at the present day. In 1802 the Charlotte Dundas successfully towed two loaded vessels of 70 tons burden each for a distance of nineteen and a half miles on the Forth and Clyde Canal. The cautious canal owners, however, decided not to incur any risk to the canal banks from the wash of the paddle, and the Charlotte Dundas was moored in a creek adjoining the waterway until she was finally broken up in 1861. During the building and trials of the Charlotte Dundas, an American, Robert Fulton, had been studying marine problems in France. Fulton was able to profit by the work of his contemporaries and particularly of his fellow-countryman, John Fitch, who also had left America for France. In 1803 Fulton carried out some successful experiments on the Seine and later ordered a marine engine from Boulton, Watt and Co. of Birmingham. This engine was sent to America, and in 1807 was installed by Fulton in his ship, the Clermont. 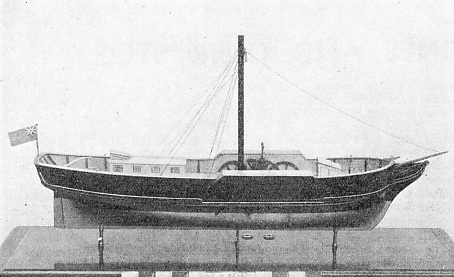 Fulton’s Clermont was built to his order by Charles Browne of New York, and was a wall-sided vessel for the greater part of her length, with a pointed bow and a square canister stern. The total length of the ship was 150 feet, with a breadth of 13 feet and draught of 2 feet. Displacement was 100 tons. The engine had a single cylinder, 24-in diameter by 4 feet stroke, and drove the two paddle-wheels through a system of bell-cranks and spur gearing. The paddle-wheels were 15 feet diameter and just over 4 feet wide. The Clermont’s engine was fitted with a fly-wheel and was supplied by steam from an externally fired boiler. It is recorded that on August 17, 1807, the Clermont attained a speed of nearly four and three-quarter miles an hour on the Hudson River between New York and Albany. She continued to ply on the Hudson until the winter of 1807-8, when she was rebuilt. She was then in service for many years under the name of North River. Two other American inventors, John Stevens and his son Robert, were responsible for two notable vessels in the early part of the nineteenth century. In 1804, John Stevens built a small steamer driven by twin screws, a device that was not to be widely adopted until after 1840. The twin propeller shafts were geared together and driven by a single inverted cylinder. The piston rod was fitted with a long crosshead, to the ends of which were attached connecting rods, one for each propeller shaft. This little steamer, or launch, was not decked, and has been preserved in a museum at Hoboken, New Jersey, U.S.A. In 1807 Robert Stevens launched his paddle steamer Phoenix. This vessel went, in a gale, from New York to Philadelphia and plied on the Delaware River for six years as a passenger ship. FORERUNNER OF CLYDE-BUILT SHIPS, the Comet is well illustrated by this fine model. The ship is here shown in her original form with two sets of radial paddles on either side, an arrangement giving place later to a single pair of paddle-wheels. The engine was forward of the funnel, which served also as a mast for the sail. The Comet was of 25 to 30 tons burden, with a length of 40 ft 3-in. She was wrecked at Craignish Point (Argyllshire) in 1820 while on a voyage from Fort William. The first steamship to run on a regular service in Britain (and first also in Europe) was Henry Bell’s Comet of 1812 - the year of Napoleon’s disastrous retreat from Moscow, and thirteen years before the inauguration of the first public steam railway. The building of the Comet was begun in 1811, and she was named after the great comet of that year. Construction was carried out by John Wood and Co. at Port Glasgow, to the instructions of Henry Bell of Helensburgh (Dumbartonshire). The Comet began her service on the Clyde between Glasgow and Greenock in August, 1812, but was withdrawn by Bell for financial reasons. From the mechanical point of view, however, she was successful, and, because the public appreciated the new mode of travelling, three other steamers were laid down immediately. With the Comet these vessels, the Elizabeth, the Clyde and the Glasgow, may justly be described as forerunners of the mighty fleet of British steamers built on the banks of the Clyde. Incidentally the district still has a large proportion of the world’s engineers. One century and a quarter after the launch of the Comet, the Clydesiders built the R.M.S. Queen Mary, of nearly 180,000 hp, described in an earlier chapter. The engine of the Comet, which is illustrated here, is of special interest, as it has been preserved and can be inspected in the Science Museum at South Kensington, London. Part of the original is in Kelvingrove Park, Glasgow. STEAM POWER ON THE CLYDE. The first steamer to run commercially in Europe was the Comet of 1812. Part of the original engine, shown here, is preserved in the Science Museum at South, Kensington. The single cylinder is 12½-in diameter by 16-in stroke and the fly-wheel is 6 feet diameter. The steam inlet is seen to the left of the valve chest attached to the cylinder; to the right of the chest is the exhaust pipe leading down to the condenser. Above the condenser tank is the top of the air pump, with its D-shaped guides. The engine was built by John Robertson of Glasgow and drove the Comet at a speed of nearly seven knots. Built by John Robertson of Glasgow, the engine has a vertical cylinder 12½-in diameter by 16-in stroke. The piston rod is attached to a crosshead above the cylinder and drives by two rods and a pair of half side levers. The half side levers are pivoted at the ends instead of in the middle, as with later side-lever engines. A connecting rod, attached to a bar joining the side levers, works the overhanging crank of a shaft running in bearings beneath the cylinder. The crankshaft carries a 6-ft flywheel and a spur gear wheel for driving the paddles. The slide valve supplying steam to the cylinder is worked from a rocking shaft, by a slip-eccentric on the crankshaft. The eccentric, driven by a pin projecting from the fly-wheel boss, is provided with two holes (to accommodate the pin) for running either ahead or astern. An extension of the eccentric rod enables the eccentric to be slid along the shaft for reversing the engine. The main frame of the engine, the condenser and the water tank form one casting. A vertical air pump is fitted, driven from the side levers. The engine was on the port side of the ship and the boiler was on the starboard side. 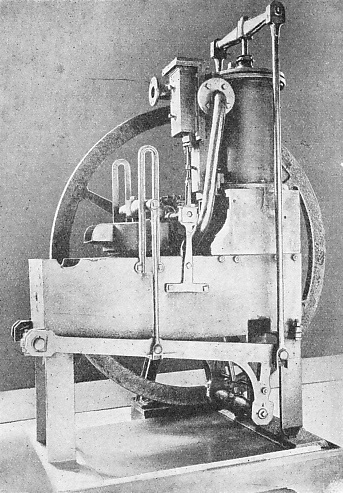 The boiler, made by David Napier, was of low-pressure type set in brickwork. Some interesting experiments were carried out with the Comet. The original cylinder was only 11½-in diameter, but was replaced by the present one after a few months’ service. Originally also there were two sets of paddles on radial arms, on either side of the ship; but these gave trouble and one pair of paddle-wheels was substituted. The Comet had a single tall funnel, and this might be described as the forerunner of the modern steel mast, as it carried a yard and sail. In 1816 the famous little steamer (she was only 40 ft 3-in long, with an extreme breadth of 11 ft 3-in) was at work on the Firth of Forth. Two years later she was employed in making voyages between the West Highlands and Glasgow. In 1820 she was wrecked at Craignish Point (Argyllshire) while on a passage from Fort William. Another Clyde-built steamer and a contemporary of the Comet was the Industry, constructed by J. and W. Fife at Fairlie (Ayrshire) in 1814. The original engine, by G. Dobbie of Glasgow, was of the side-lever type with a single cylinder, 16-in diameter, developing 10 hp. This vessel of 83 tons was 68 ft 4-in long, 16 ft 6-in wide and 8 feet in depth. Re-engined in 1828, she continued in service until 1862. In 1815 a rebuilt barge, the Elizabeth, was engined by Charles Baird at St. Petersburg (now Leningrad) for service on the Neva. In this vessel also the engine was of the side-lever type, with a single cylinder supplied with steam from an externally fired boiler provided with a brick chimney. Despite the use of a brick chimney, however, this vessel incorporated an important improvement in the design of the paddle-wheel. This had four floats, which by means of bevel gear were kept vertical throughout their revolution. The advantage of using a paddle that entered and left the water vertically will be obvious, and this “feathering” was extensively used in later years. The earlier marine engines were generally arranged with the cylinder inverted, as was the practice on land. The stationary engine on shore, however, had a large pivoted beam supported on a pillar, above the cylinder, that actuated the fly-wheel shaft. Beam engines have been used on paddle steamers, particularly in America, and a few still remain in service, but the general practice was to place the beam below the cylinders. Thus were evolved the famous side-lever engines in use until after the introduction of screw propulsion about the year 1840. BRICK FUNNEL AND FEATHERING FLOATS provide a striking contrast in this picture of Charles Baird’s paddle steamer Elizabeth, converted at St. Petersburg (Leningrad) for service on the Neva in 1815. The brick funnel served a rectangular externally fired boiler supplying steam to a single-cylinder side-lever engine fitted with an air pump. The paddle-wheels are interesting, as the four floats, of the feathering type, were provided with bevel gear, so that they entered and left the water vertically. Feathering floats were improved upon in later years and fitted to paddle-wheels over 30 feet in diameter. You can read more on “The Development of the Screw Propeller”, “Oscillating Paddle Engines” and “Where the Queen Mary was Built” on this website.